What's New? - From the Yardarm cont. A rare moment in time and history. 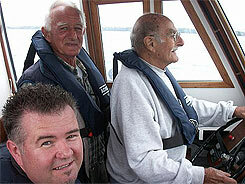 Able Seaman Ken Johnstone, who served in HMS Diadem from 1944 to 1947, seen in the cockpit, and alongside 43957 with his son Dwayne, at Hythe, 18th October 2007. Ken well remembers the demise of the original boat, and will send us the log extracts covering that episode in Diadems life. Ken tells that the FMB hull was light blue, as was the deck. at that time. 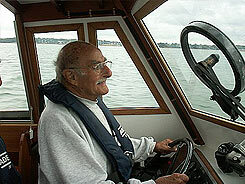 More importantly for us is that Ken advises the boat had a seperate throttle control, not connected to the gearbox at all. Ken has offered us his mounted crest of Diadem which I have gratefully accepted. 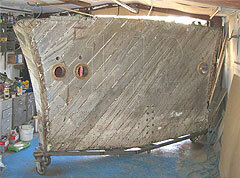 I have told him it will be displayed in the cabin, on the aft bulkhead. His main function on board was that of Coxwain. Ken will also send us a full 45 page history of Diadem, and put us in touch with the remaining Diadem crew. Ken and Dwayne live in Canada, and are here on a short visit, so dropped in on the off chance of seeing the boat. This meeting left me feeling really humble, and puts into perspective all that we are striving for. What a privilege and honour to be able to give someone so much happiness...just sitting in a boat which he hasnt seen in 60 years..! 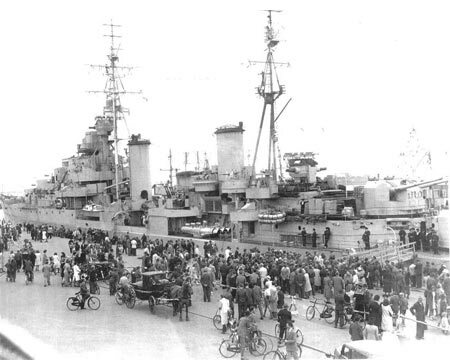 The 2 photos of Diadem were taken in Coppenhagen in 1947, and clearly show the FMB. A rare moment in time and history indeed..! 72ft HDML Gibel-Tarik Ex ML 1301 arrives safely at Ijmuiden harbour, The Netherlands, after a long sea journey from Gibraltar. The 65 year old vessel, with her original Gardner diesels, made the trip without a hitch. She crossed the Bay of Biscay in one run. She was crewed by her new Dutch owner Klaas and his friends, including the son of the vessel’s wartime commander. She will now be further restored, to end up looking even closer to her original appearance. Christian Sheppard-Capurro. From the recent Newsletter you will have been expecting the arrival of the calling letter for the 2007 AGM, planned for the 15th September 2007. After serious consideration, the Board members have made a decision to move the planned date from the 15th September 2007 to the Sunday 18th November 2007. There are a number of reasons for this change, and we hope that you be able to both understand and agree with the decision........ Click here to read this report in full. FMB 43957 ex HMS Ark Royal afloat in Hythe Marina. 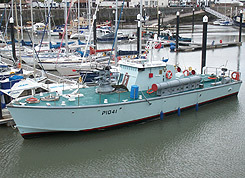 The boat arrived in Hythe on the 24th July, and was put in the water on 25th July 2007. We are hoping to have her operational shortly. Unlike 'Miss Sian', the first in the series of ex military FPBs we featured in 'Yard Arm' a short while back the history and class of Thunderchild (35ft FMB), a similar though not identical craft is something of a mystery.... Click here to view the whole article in Boat Histories. You will notice that we have changed the "News" chapter heading, and replaced it with "From the Yardarm". We are very lucky to have the services of Mike Taylor, a well respected Journalist, who has offered to write a monthly article for the Trust. We start the ball rolling with "Miss Sian", otherwise known as FMB 43129. We are also very much indebted to Mr Phil Simons, our Hon Historian who answers so many of your incoming questions re the boats out there. Mr Ted Else, who looks after the Forum on our web site, is an indispensable person as a policeman and adviser, thank you all for your kind assistance to the Trust. Should you know of any interesting journalistic projects which we could investigate, please send them I to the trust (click here) or safemariner (click here) via email, for our attention and follow up. We are in the process of expanding our model collection (click here to see model chapter on the Forum) and should you know of any boat models which need a good home, please let us know..!. We hope you enjoy reading the articles we hoist at the Yardarm. 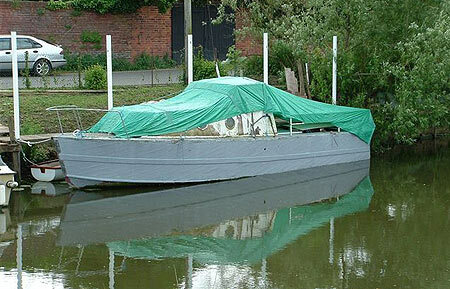 This boat, MSMB 5302, was built by McGruers at Clynder in 1953. 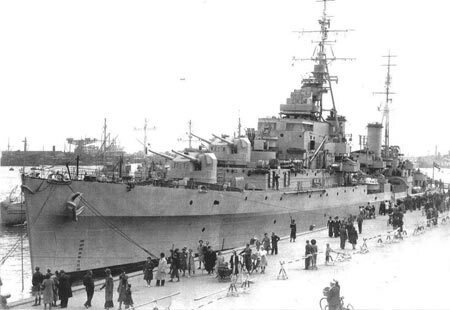 She was allocated to HMRY Britannia, and remained with her until replaced in 1971. Her present owner Daniel Earl, is in the process of getting her ready for his private use, and expects to have her back in the water in September this year. She presently has 2 x 80hp Fodens as motive power, and is ashore in South Shields. Click here to send Daniel an email. Daniel has very kindly agreed to put our web site address on the hull, so we expect many more visits to our site. Many thanks Dan, and we look forward to more news as you progress. See the links for new addition covering the Australian Heritage Fleet. One of our Trust members, Tim Deacon, has given us a fascinating article covering the Polish MTBs and MGBs. 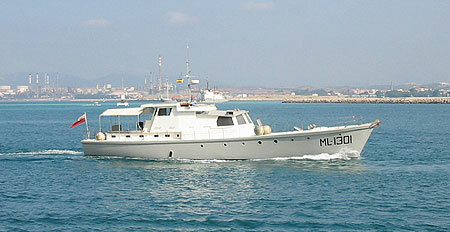 Go to "Polish MTBs/MGBS" in Boat Histories and enjoy a detailed history of these boats. Any information or enquiries, please direct to Tim via email by clicking here. As promised, we have the first article from Mike Taylor, covering the FMB Miss Sean. This is the first of, we hope many interesting articles for your enjoyment. To read this article, just click on the title above. Richard Basey, leader of the MTB102 team based in Norfolk, has issued the schedule for the boat this summer. If you would like to visit the boat, click the title above to view the details. The transom of HSL142 survives in the garage of member Peter Arnold here in Southampton. Peter is well on the way to getting this transom looking good. RTTL 2758 in Malta. Here is a brilliant conversion for some lucky person. approximately 150ltrs. Range at this speed 26 hours. For many more pictures see "Boats for Sale" page. 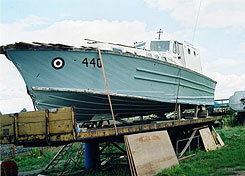 ST440 alias Pembroke Puffin, on a farm in the midlands, prior to undergoing restoration. She will in all probability retain her present superstructure. Flt Lt Bond returns to familiar places after about 66 years..! Seen here at the controls of ST 1502 doing 20knots, with his Son and Grandson in company. Flt Lt Bond was Skipper of HSL 123 during Operation Jubilee, the Dieppe Raid, in July 1940. HSL123 was lost during this raid, the report stated as follows..
"HSL123 was attacked by 2 FW190 aircraft, and later by 4 FW190 aircraft. It also came under fire from shore batteries, and eventually sank, with the loss of one crew member and six others wounded"
HMS Gay Archer, seen at Watchet harbour recently. ST1502 returns to the water, 3rd August, after a good underwater clean, courtesy the Marchwood Seamount Centre, and having the propellors tweaked to operate with the 100hp engines. She managed 20 knots on trial, against the tide and with a force 3 blowing, an excellent result. 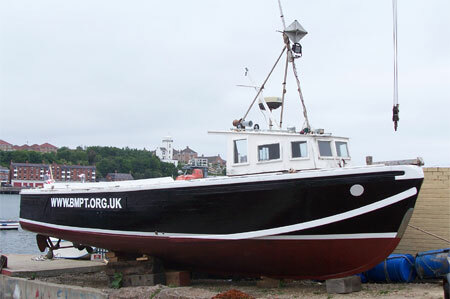 She is available for hire at reasonable rates, and contact Terry Ford 023 8089 1628 for bookings. "Queen Gull" back in full uniform, with her current owner Ivan Gardner. 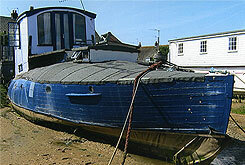 This boat was originally designed as a remote control Army coastal defences target. Courtesy Ivan Gardner and The Classic Motor Boat.